Remember Back to the Future II? Marty McFly had gone to 2015 and gotten a pair of high-tops that auto-lace themselves? If you don’t, here’s the clip. That was back in 1989, but in 2015, Nike released the Air Mag, an actual self-lacing and auto-adjusting shoe. It presented the first pair to Michael J. Fox, for whom the technology is particularly important, since he has Parkinson’s Disease. Nike didn’t stop at the limited edition Air Mag, however. In late 2016, it presented a small production of the world’s first self-lacing sports shoe, the Hyperadapt 1.0. Several colourways were released and they were hyper-coveted. We managed to try on a pair last year and we put together a short clip of the shoe. That still wasn’t enough for Nike, however. In the last year, they’ve been working on industrialising and ramping up production of the Hyperadapt 1.0 and last week, that became official. The 2018 edition of the shoe does come with some differences, ranging from the packaging and other details. Here’s a different clip of the new shoe that we acquired. We could not resist them. The biggest difference is with the uppers. The Flyweave technology that the Hyperadapt 1.0 uses comes in a more complex weave now. The advantage is that it’s a more comfortable and flexible shoe, and it also protects the internal circuitry of the shoe well. Nike reminded us that the shoe is not water resistant and since there’s a battery and wiring around it, to avoid water as much as possible. Light splashes are ok (we tested our shoe and it’s still fine), but don’t get it soaking wet. Overall, the shoe fits snugly around your foot. It’s a real sports shoe, designed for actual sports. So you can wear it to run on the track if you like. The self-lacing and adjustable technology means that the laces are constantly fitted so your feet don’t slide slightly forwards or backwards like in a regular shoe. 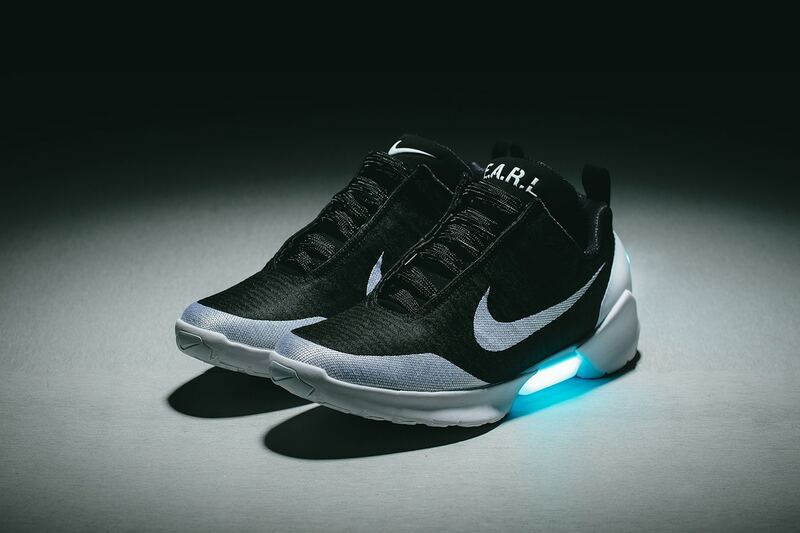 The “E.A.R.L.” emblazoned on the tongue is short for Electro Adaptive Reactive Lacing, and it activates when your foot hits the insole. One final note: the controls do take getting used to, especially if you’re like me and are always lazy to loosen your laces before slipping them off. The buttons are much improved, however. The earlier edition didn’t quite align the indicators with the controls hidden under the canvas. The new version is exactly right, so you don’t have to feel around to loosen or tighten. The Hyperadapt 1.0 is available at Singapore’s Dover Street Market NikeLab section. It’s priced at $999 and it’s the only place you can get your hands on them in the entire Southeast Asia region. So grab them quick.